Do you think you cut your finger tendons and need a flexor tendon repair? Do you think you cut your finger tendons and need a flexor tendon repair? If you find yourself asking this question, then you most likely have some sort of cut or laceration on your finger or hand. Maybe a knife slipped in the kitchen. Maybe you had an accident in the garage while doing some wood work. No matter what the cause, if you find that you can not bend your finger after a sharp laceration or cut (unless you push the finger with your uninjured hand), then you probably have a flexor tendon injury in the finger. That being said, there are cases when a finger tendon can pull off the bone and prevent motion as well. Sometimes, numbness can be associated with this injury, and is indicative of a nerve injury as well. Flexor tendon injuries are best repaired by a hand surgeon. It is imperative that these injuries be treated quickly, as the results are better if the problem is addressed early – usually within 1 week from the time of injury. Occasionally, both arteries that supply the finger with blood can be cut as well. 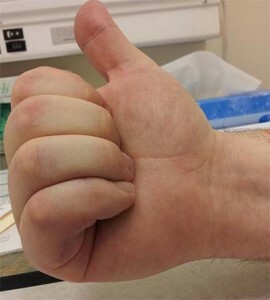 If this occurs, the tip of the finger is often less pink, or the redness in the finger tip will take longer to return after the finger tip is squeezed. This is an emergency and needs to be repaired on the same day as the injury. In many cases, however, at least 1 blood vessel is still working and the finger can be fixed at a more convenient time for the patient and the hand surgeon. The flexor tendons in the finger pass though tunnels in the finger called pulleys. These pulleys form a very tight fit, and meticulous technique is required to repair the tendons while reducing the size of the tendon at the repair site. This will allow the tendons to glide under the pulley and restore motion. At the Hand Center of Nevada, Dr. Vahey and Dr. Gluck have sub-specialty training in micro surgery and hand surgery. Not only do they specialize in treating this type of injury, but they also provide VIP/concierge style treatment at no extra cost. This includes closely supervised hand therapy in their office and direct access to your surgeon at all times. Early therapy is necessary to prevent scarring of the tendons and to keep them moving during the healing process. The image below shows a patient at 4 weeks after tendon repair surgery with the fingers extended and then flexed. Two tendons and a nerve in the small finger were cut, along with 1 tendon in the ring finger. A strong, smooth repair, refined technique, and aggressive therapy led to these good, early results. Please contact us for a consultation at 702-798-8585 if you are concerned about a possible tendon injury in the hand or finger.